Former Northern Ireland international Chris Baird announced this week that, having been out of the game since the end of last season, he’s decided to hang up his boots after a long career that saw him play for eight clubs and win 79 full international caps for his country. 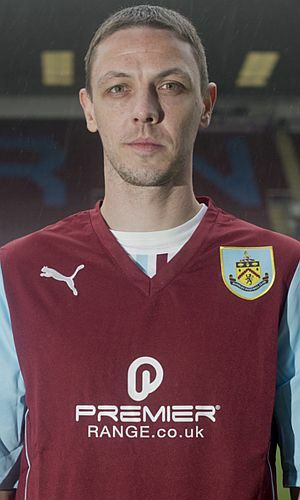 His stay at Burnley might have been a short one, but it was a vital couple of months almost five years ago, and one that would have been extended but for his personal circumstances. We were due to play Charlton in a Championship game at The Valley and we’d been hit with Kieran Trippier, a player who hardly missed a game, having suffered a hamstring injury. Sean Dyche, in his first full season as Burnley manager, turned to a player he’d played alongside at Watford in Baird. He’d left Reading in the January, was a free agent and we brought him in until the end of the season. He started the next five games, playing well in them. We picked up ten points in those games before he dropped out for Tripps to return for the home game against Middlesbrough. Baird made two further appearances as a substitute and all but got the last touch of the ball in the 2-0 win against Wigan that clinched promotion, his last game for us. Dyche was reportedly keen to keep him but Baird didn’t want to move his family in the south of England and so for a move to West Brom. After one year there he ended his career with three further years at Derby. He was a Southampton player when he first played against Burnley. Twice he played at Turf Moor in the 2003/04 season for two different clubs while out on loan. He was in the Walsall team that we beat 3-1 courtesy of a Delroy Facey hat trick in October 2003. Later that season, he formed half of the Watford back four with Dyche which beat us 3-2 on that farcical day when Stan Ternent had been banished to the stand and we saw Ronnie Jepson running up the steps to ask him what to do when it appeared Dele Adebola didn’t want to come on as a substitute. His final Turf Moor appearance was in the 2014/15 season. He played for West Brom in their 2-2 draw here on a day when both their goals should have been disallowed and when Dean Marney suffered the first of his two cruciate ligament injuries. That game was just four years ago today. It wasn’t a long Burnley career he had, but we were very grateful he was available at the time and I’ll probably remember him most for that incredible goal line clearance in the 1-1 draw at Watford.